This is a first for me. I’ve personally never seen a tower-defense/territory capture game like this. You send a limited number of troops from a tower you own to a tower you need to capture. If you leave yourself with not enough troops, the enemy can come and take your castles. The higher you can reinforce your towers, the better off you are when you try to capture castles belonging to your opponent. This is Bees vs Ants and it’s brought to us by Racoon Game Studio. This is iPhone, iPod touch, and iPad app is available for $0.99 or free with the Lite version. This is war. You play the yellow bees and you combat the blue, red, or purple ants. You have different towers you have to capture, each presenting different obstacles to overcome in order to successfully capture it. You must send bees to lower the number on the tower, and then once it’s yours, you must send more bees to increase its number. The higher the number, the more bees you have to defend yourself from attacks or the more you can send to adjacent towers. It’s a big challenge since the paths differ and you can only send troops down a single path at a time through your finger from one tower to the next. The background images are beautifully done with different places to go such as a backyard with very nicely done grass and fence, some kid’s homework desk with the oddly outdated fountain pen, and of course, the floor. Each scene is very well drawn and each have a different personality to them despite not directly affecting gameplay. The towers are well done and visually distinct while the little bees and ants have nice graphics, though you won’t be able to see them very well during gameplay since you are busy trying not to lose. Controls work alright but I constantly find that the bees will stop going to the next tower, even when I don’t want it too. Nothing in the game states that there are only a certain amount of bees that can be sent, but I guess constantly dragging multiple towers is a good way to fix that. The opponent CPU is tough. Really tough. It could be that it’s because of my newbie skills in this style of gaming, but it gets really tough, even in the first world. I love that there are 30 levels you can work your way to, but man it gets really tough, really fast. 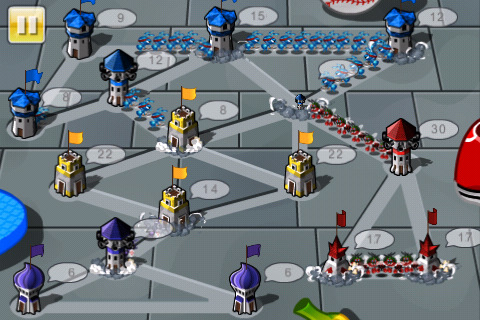 My best strategy is to block up the enemy’s capturable areas by reinforcing a few key buildings with troops while constantly increasing my tower’s power. Once the main blocking towers reach 100, the opponent has no chance of surviving the invasion since they can’t capture more and their numbers will almost always be lower than 30. Even with this tactic, I still lose hard on many levels. A truly challenging game that really doesn’t feel like the game is cheating you or being unfair, it’s just a big hill for you to climb (ironically, as insects). The graphics are really good for what it is and I really appreciate the play style and genre. I liked this one and with a Lite version available, you can see if you like it for yourself. AppSafari review of Bees vs Ants was written by Joseph Ho on September 26th, 2010 and categorized under App Store, Games, Resource Management, Strategy. Page viewed 7513 times, 2 so far today. Need help on using these apps? Please read the Help Page. I’ll give it a try though if it’s the same fun as for MW..
– Do Enjoy the game as much as i did, I cant kill time (hours) simply on this game till the battery runs flat !